You might have seen my post last year about things Toby was terrified by. 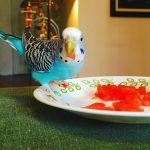 One of the main offenders was watermelon, the sight of which so traumatized her last year that she retreated to her cage and could not be coaxed out for the rest of the day. Now last year at this time Toby didn’t have Kelly, and I wasn’t aware yet of the importance of a flock. Fast forward to this year, I decided to try watermelon again because Kelly is a total fruit nut, and is not afraid of the color red. 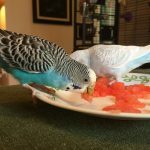 I did my usual routine of getting out their plate and the fruit and putting on a good show of eating it myself and exclaiming over its goodness. Kelly came over to my shoulder first and was very excited, and then lo and behold here comes Toby, who is so blasé about being confronted with something red that you’d think she was a different budgie entirely. Offering her a little piece while she was on my shoulder did cause her to recoil a bit, but Kelly was more than happy to stick out her tongue and test the melon for edibility. 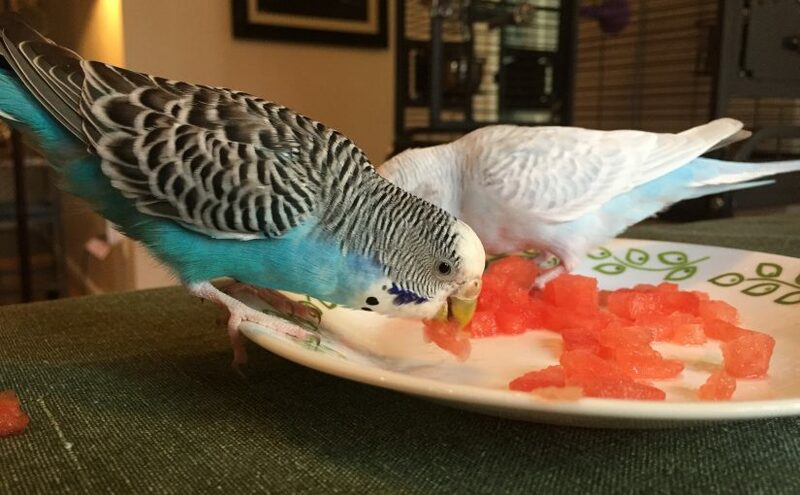 Discovering that it was, in fact, awesome, Kelly got even more worked up and immediately hopped down to the kitchen counter and started eating the watermelon before I was done cutting it up. 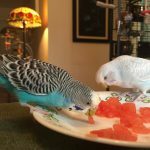 Toby immediately followed suit, and they both proceeded to eat more of any fruit or vegetable than I think I’ve ever seen before! They ripped larger pieces into shreds, carried some off and dropped them all over the place. Not a snack for the mess-averse, but I feel it is well worth it to see them really enjoying a treat. 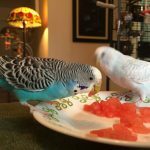 It might be easy to see how this illustrates the importance of keeping more than one parakeet. Solo, Toby was terrified of so many things that limited her life and her enjoyment of her surroundings. No matter how bonded she was to her humans, there was absolutely no way that we could fill that role in her life. 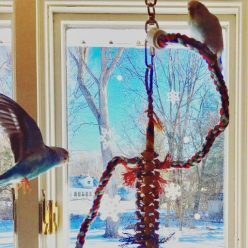 She needed another parakeet desperately to be the leader and to show her things were okay. This was even further reinforced for me on the same evening, they were getting settled in to bed and going through their recent nightly routine. 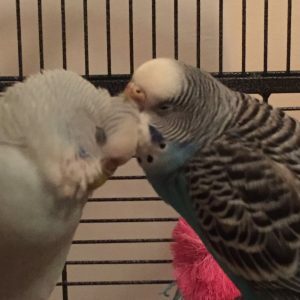 They are both molting, and once I start dimming their light they head up to the top perches in their cage and take turns preening and feeding each other (before it devolves into fighting over who’s going to sleep where). Spying on them during these quiet bonding moments I know that Patrick and I could absolutely never fill that void for Toby the way Kelly does. And instead of taking something away from us, it just makes our flock stronger because everyone’s needs are being met in a way that they weren’t when we were just a flock of three.